Discover Argentina's traditional foods on this 3-hour walking tour of Recoleta with an in-the-know guide. Visit several of the elegant neighborhood's best restaurants to sample authentic cuisine such as empanadas, dulce de leche and parilla. You'll taste Argentine wines and dine like the locals on this food-lover's tour of one of Buenos Aires' most charming barrios. Meet your guide at the entrance to the famous Recoleta Cemetery, the heart of this historic Buenos Aires neighborhood. Stroll through the early evening light down picturesque streets toward your first restaurant stop. 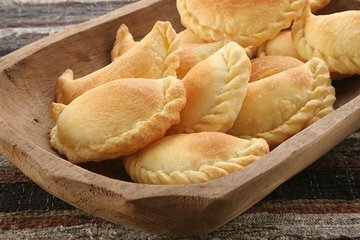 Taste authentic empanadas with cheese, beef and vegetarian fillings at this typical Argentinian neighborhood cafe while learning about the history of one of the country's favorite foods. Continue to the parilla restaurant for your main course. Enjoy a glass of local malbec paired with the country's famously high-quality beef and other tasty options. Move on to your final stop, a restaurant that serves homemade ice cream topped with decadent dulce de leche. This rich caramel sauce is a favorite among the locals, who also consume it in the country's traditional cookies called alfajores. After dessert, try some mate, a traditional Argentine tea that has a history and culture unto itself. After your culinary tour is complete, feel free to explore Recoleta on your own. This was our favorite tour in Buenos Aires! Our guide was knowledgeable and very personable.. It was like hanging out with an old friend while sampling amazing food in the neighborhood! LOTS of food and everything from empanadas to ice cream. No dinner reservations need after this tour! Highly recommend. Our guide Galla was great! She walked at a nice pace for us to follow and took us to three restaurants - one for appetizer, one for main, and one for dessert. She explained the Recoleta neighborhood, food and meals, and prepared their traditional mate drink. We had empanadas, steak, and gelato - very nice! A very good food tour which samples foods in a very nice neighbourhood of Buenos Aires. This food walking tour in Recoleta was actually a complete meal. Just wish that we had learned more about the actual neighborhood, more background info, not just going from empanadas place to neighborhood steak place to ice ice cream parlor. I am not sure that the guide added too much to the tour, although she was friendly, warm and easy-going. A perfect introduction to the basic food groups of Argentina -- empanadas, beef, ice cream. and mate. Venues were interesting and different, food very tasty and plentiful. It was supposed to be a group of seven but four didn't show up so it was a much more personal experience than it might have been otherwise. Talking about the food culture in Buenos Aires and sharing stories was great! Only issue, which others have noted, is that the meeting place is crowded and it is not easy to spot the guide. A sign, distinctive tote bag or t-shirt would have been helpful. I enjoyed this food walking tour very very much. My tour guide, Gala, was such a refreshing, vibrant person that it was like walking with a friend who is giving you a tour of the best food that is served in traditional and authentic Argentinian restaurants or shops. She also adds so much history into it that you get to understand the context of how such food became distinctly Argentinian. All the food that she made me taste were indeed the best I have tasted--the Beef Empanada, the Beef Asado or Grilled Beef was delicious and grilled to perfection, the sidings were just as superb! I looved discovering about the Yerba Mate which is an influence from the Northern side of Argentina and of course the dessert, the gelato--mainly an influence from Italian immigrants to Argentina, was a great way to end our tour! I would recommend this tour for those who wish to really get to know food in Argentina from the traditional and best sources, rather than the commercial, touristy ones! Great walking tour, excellent local guide and amazing food! Under NO circumstance should you eat breakfast before this tour! Go early and wander Recoleta Cemetery before you meat see what I did there your phenomenal guide for a great walking tour of the neighborhood. First comes the best empanada I've had in my life. Then we circle back to the cemetery area to a parrilla. At first I thought, oh no, we're going to a tourist trap. But it was REALLY good. And the food kept coming. First out proveletta, chirizo and salad with many types of breads and condiments. I was happy and content with this. Then the entire side of beef came out! A perfect medium rare, 2 inch thick steak. Oh, and did I mention the included glass of Malbec that was about 300 ml? Next I tried Mate made in the traditional way an acquired taste. Finally, if you can still stand up after a meat coma, there's a stop for ice cream.... something I never knew BA was famous for. It was on par with anything I've had on a street corner in Italy. A perfect afternoon with an expert guide eager to share culture and knowledge about BA. A MUST tour if you love food culture and a great walk. We arrived at Recoleta and had to look for our tour guide. He did not have a sign and we had to ask several people. Eventually after about 30 minutes of searching we found him. Otherwise it was a nice tour and we loved Buenos Aires.